The last jobs on the fence were attaching the mesh to the star pickets, running the top wire and a white sighter wire for the horses’ benefit. 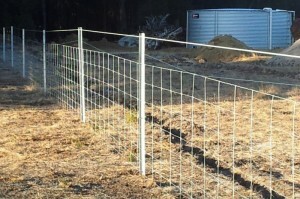 We use the pre-fabricated star picket fence clips which are easily twisted on to the wire. You can do your own, by cutting bits of plain wire as you go, but the the clips are much easier and quicker. Brad did the top one and I followed behind doing the middle and bottom ones. Each fence has 3 or 4 clips on the 8 wires depending on where the holes were in the star pickets. I have discovered that not all star pickets are equal and this fence is made up of odds and ends. I obviously disturbed a bull ant nest and got a bite on the back of my leg which was pretty painful. Knowing my normal reaction to bites and stings, I limped back to the house keeping as much pressure on the bite as I could and took the usual cocktail of anti-histamine and anti-inflammatory pills and applied the anaesthetic cream. The last job before lunch was looping the top wire through the middle of the top wire of the mesh and threading it through the second hole in the star picket. 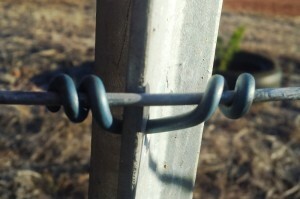 This keeps the top wire taught and stops the fence from collapsing down if anything leans on it. 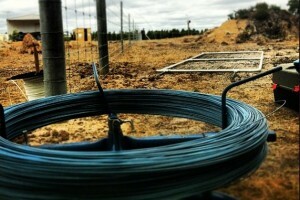 The flexible sighter wire in the top hole will also keep the pressure off.